Your ongoing support ensures that the Arboretum remains a living laboratory for students and a popular venue for personal visits and community events. The Romweber and Santogrossi families (pictured at left and above) at the dedication of the Linden Alleé. 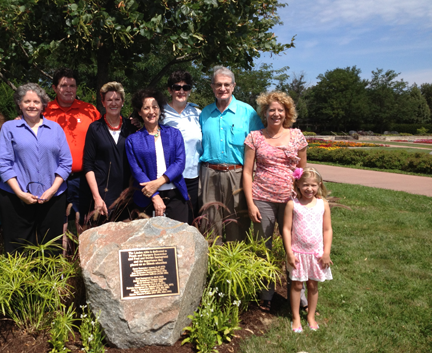 The gift of the benches for the Alleé is just one of many examples of gifts provided by our generous donors. To make a gift online, please enter in the amount you wish to give, and then click the "Continue your donation" button. You will be forwarded to the University of Illinois Foundation's secure giving site to provide your payment information. Promoting overall maintenance, expansion and quality of plantings (gardens and trees) at the Arboretum. Providing internship opportunities for students to gain hands-on experience while assisting with the arboretum. Supporting the design, plantings and maintenance of the Arboretum’s Hosta Garden.